The Kolcas invaded Newport Cinema 4 of Resorts World in Pasay last Saturday. 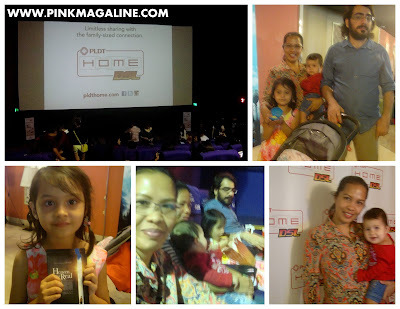 Actually, a number of families including ours were treated to the block screening of the movie Heaven is for Real courtesy of PLDT HOME DSL. Mind you, it's been a long while since the last time I went to Resorts World that I got a bit of confusion when asked by an assistant about my membership card during valet parking registration. Hubby and I used to go there for some entertainment, but we stopped since we moved to a much farther place in the metro. I'm glad we were invited to this event 'cause we had the chance to bring the kids and bond as a family in Newport City. The 45 minute ride with all the traffic was worth it. Clockwise: the big screen of Newport Cinema 4, our small family, my elder daughter holding the tickets to Heaven is for Real screening, us again, ready to watch the film, and my baby girl and I for some photo op at the PLDT HOME DSL booth. 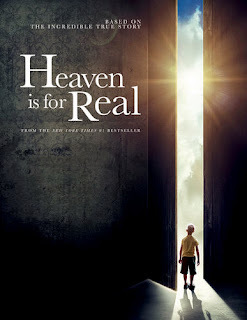 The movie Heaven is for Real is a family flick which is based on a true story of a young boy named Colton, son of a Christian pastor Todd Burpo. It is movie I recommend to modern families like us for inspiration and some spiritual uplifting. In my observation, most of the people who came to the screening seemed to liked this movie. Personally, I want to watch it again with my family in the comfort of my own home. By the way, spotted at the cinema were some local celebrity families. Too bad I don't have a photo of the Ledesma family and Diego, the 7 year old star in PLDT HOME DSL's newly launched TV commercial. If you haven't heard of him yet, he is a bright young boy who maintains "Ask Diego", an advice column on Facebook, with the help of his mom and dad. He is so popular with almost 200,000 fans as of this writing. Below is the TVC with the very handsome and witty Diego in it. Our family can totally relate with the Ledesma family. We are an urban and tight-knit family with PLDT HOME DSL connection, a connection that helps both my husband and I in running the household. For example, I am able to tell my husband who is working in his laptop at the living room to tuck our elder daughter in bed, while I'm breastfeeding our baby daughter to sleep in the other room, with the use of our family-sized connection. My phone is always connected to our internet wifi so I just send him a private message. That way, I don't have to disturb our little one and allow my husband to bond with our firstborn as he help her brush her teeth and get ready for bed. Aside from using gadgets simultaneously, another example of PLDT HOME DSL's big help is being able to easily communicate with my in-laws in Istanbul with the use of free internet calls, social media, and blog. Plus, our family can watch clips and movies, I can find teaching materials and short stories for my elder daughter, shop for the family, and book tickets and hotels for our out of town trips. Indeed, PLDT HOME DSL's limitless-sharing has been a great help to us. To sign up for your own strong, reliable family-sized connection of PLDT HOME DSL, visit pldthome.com. It's been so long I haven't visited your blog, and now I'm happy to be here. I watched Heaven for Real's trailer 2 weeks ago... me and hubby's planning to take Mr.Freddy to watch it. Hopefully this weekend when it's still showing. Hi dear! Thanks for dropping by. Hope Mr. Freddy likes the movie. Cheers!